← WordPress 2.6 is here! 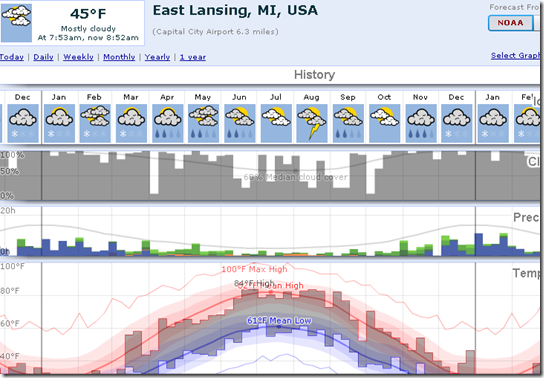 Living in Michigan, checking weather has become second nature to me as it changes so often here. Last week it was below freezing and today it’s going to hit 60F. I usually check Weather Underground or Weather.com to get my update. I also have the Weather Channel iPhone app to check it on the go. These are great options to check today’s weather or even 10 days out in the future. What if curiosity was in the past? Like, what was the coldest temperature this day in the past? 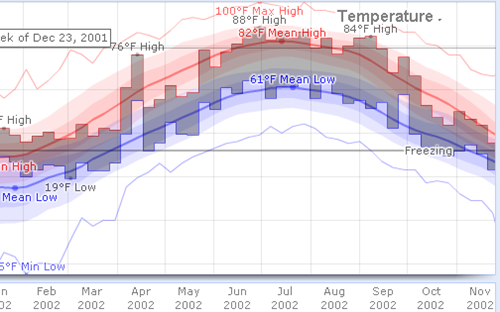 WeatherSpark.com is a website that gives you not just forecast from various sources like NOAA, Met.no and WWO. Once you type in your city or zipcode. you see the current weather plus you see a nice graph with the history. You can see daily, weekly, monthly, yearly or 1 year increments. The data goes back upto 1940. Another nice feature is that, the app shows a map of your area on the left half. It shows how there is a couple of degrees difference in the towns around you. This is a fantastic site if you are into looking up if today’s weather is in the average or part of a historic low or high. 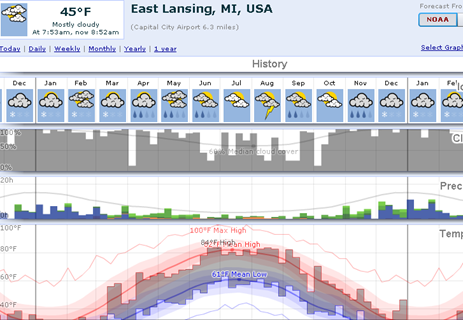 WeatherSpark.com is a perfect companion for the weather geek in me.